What domains have you sold lately? Are you buying domain names? Trying to sell these domain names? Don’t sit back and hope you’ll sell your domain names. As a domainer, you must be active in the domain game. What domains have you sold lately? Preparing a sales pitch takes time. You may get discouraged. Many businesses lack professionalism. No wonder such businesses fail to retain their customers. These business owners will forget your name, never call back, and make up excuses. What if a customer imitated these businesses? Most businesses would close their doors. Why is this information important? These are the people you hope will buy your domains? If you don’t operate a domain company, you will find that selling domain names is a tough act. There are many successful domainers. They make a living from buying and selling domain names. However, their success relies on making business contacts. Businesses would rather conduct business with another company rather than to take a chance with you. The next time you prepare a sales pitch, stop and think about your main goal. Do you want to waste your time trying to sell your domain names to a business? You may consider contacting domainers to buy your domains. Price and demand are two important indicators. Pricing your domains too high will decrease your sales. Offering the wrong domains will get rejections. Businesses rarely follow-up with a domainer. They may call a domainer when a domain is their top service. There is sense of need that overshadows demand. Companies want domains, but must make decisions based on their marketing budget. For the most part, a clear need drives the online market. Deal with the need aspect rather than waste time with want and no demand for domains. If a domainer prices their domains right, they will sell many domains. Furthermore, presenting the right domains will increase attention to a domain portfolio. In order to succeed in the domain space, you have to generate revenue through developing and selling your domains. Don’t waste your time reading domain blogs if you don’t plan to apply the information. You want to sell your domains? List your domains on several domain platforms. Set the same prices or use the ‘make an offer’ option. Setting a fixed price above another buyer’s price limit or expectations can eliminate a potential sale. Choose a good price, make an offer, or include the combination of price and make an offer to increase your domain sales. Consider trading your domains to another domainer to acquire domains more aligned with your future goals. Know your market. Learn everything there is to know about your domain portfolio’s keywords. Contact many businesses because then you increase the probability to sell your domains. A rejection e-mail may lead to a potential sale. Make friends with the most successful domainers. These domainers may buy your domains. Don’t be a passive domainer. Waiting to make a sale is like hoping for success. Successful rarely arrives unexpectedly at your door. Market your domains to put them in front of an audience. Supermarkets must market their products or else they lose out to their competitors. Still want to sell your domains? Domain blogs want people to read their blogs to make revenue and to maintain a competitive advantage in the domain industry. Domain blogs and domain companies are like policymakers and interest groups. Domain newbies are identified as the target consumer market. A domain noob will click on ads, use affiliate programs and ask for advice. These same noobs will ask the same question over and over again. How do you know when you reached success as a seller in the domain industry? You will know once you make sales without asking questions. You can negotiate deals to come to an agreement. You never hesitate while making cold-calls. What domains have you sold lately? If you haven’t sold a domain, then you better reevaluate your domain goals. Do you make revenue developing domains? Are you carrying around high annual renewal fees? Think carefully about your domain goals to make future domain sales. ResumeNYC.com is currently up for sale on Craig’s List. 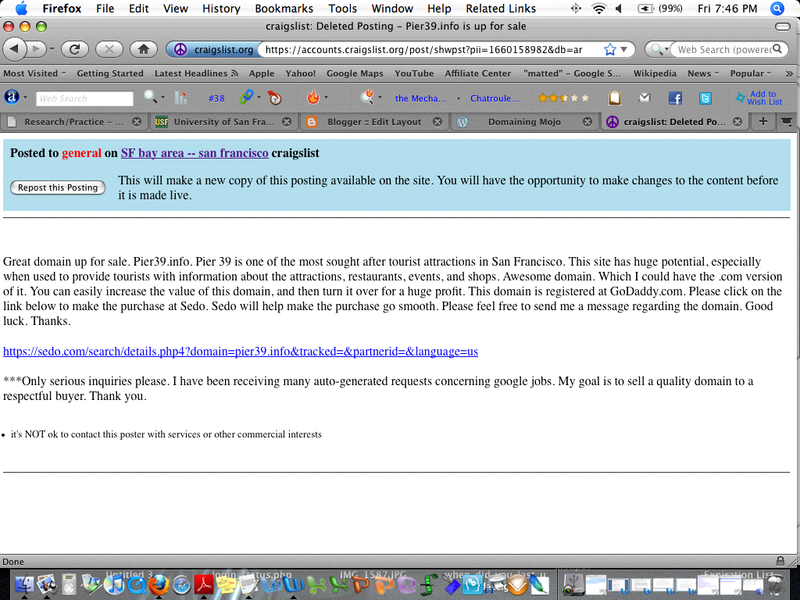 The sample Craig’s List ad below shows a sales pitch in action. When you sell domain names specific to a location, you are limited to rotating them. However, in a city such as New York City, you have millions of people, dozens of districts, and five boroughs to find buyers. Once the ad expires, I may have to evaluate whether to keep the domain in the Financial District, or move the domain to Downtown, or SoHo, and then maybe Battery Park. I have many alternatives to list in New York City, but far more GEO opportunities to rotate BeachHomeRentals.org throughout the United States. I provided a sample of ResumeNYC.com because I submitted BeachHomeRentals.org to Sedo’s auction for consideration. The fixed price link is currently unavailable while the decision is pending. I try to be optimistic even though I know that Sedo rejects 100% of all my domain names submitted into their auction screening process. Mike, who runs Domain Sherpa, informed me that the link goes straight to the brokerage section. Good catch Mike! Domain Sherpa is definitely an innovative domain blog with an encyclopedia of domain resources. 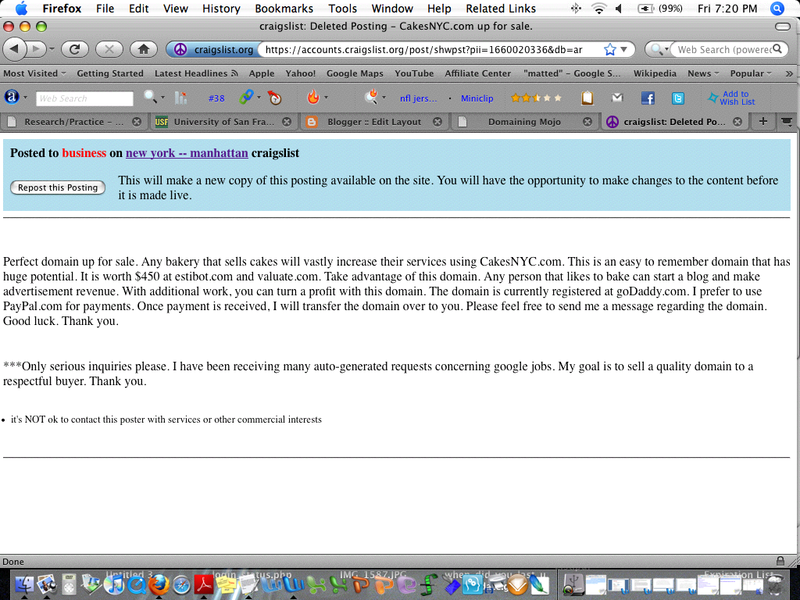 Samples of ResumeNYC.com’s Craig’s List advertisement and the Sedo sales page are below. Thank you. The Sedo’s sales pitch shows ResumeNYC.com at a fixed price of $500. Pier39.info was placed in the Mission District on Craig’s List. The webmaster to Pier39.com purchased the domain, which is now pointed to the .com. I changed my sales pitch from the previous sale to refer buyers to Sedo. Moreover, providing the link reduced spam associated with replying to emails that sent generated auto responses. When you list a domain on Craig’s List, mostly likely you will receive many e-mails soliciting moneymaking opportunities, jobs, and money orders in exchange for a payment. Don’t rely on these domain leads because they are not reliable. Maybe you might get lucky and find a buyer, but chances are the majority of replies are unreliable. You can verify on Sedo whether a person has visited the domain sales page using the sales setting. After the past domain name sold in New York City, I decided to place a link to send traffic to Sedo. Whereas, I only made two sales on Craig’s List, the sample will demonstrate what I wrote in the body of the advertisement to find a buyer. Good luck with creating a custom Craig’s List ad to make a sale. Thanks. The following advertisement that was placed in Manhattan found a buyer, which visited the domain on Sedo to purchase the domain. Since then, I made some adjustments on my sales approach to refer buyers to a third part domain sales platform. The sales pitch was prepared during the learning stage. The original ad is below to show you an example of what the buyer used to make a decision. I thought of an idea that crossed my mind last week. A good way to find a buyer is to find a parked domain related to your domain name. Input the domain keywords in a search box. Make a list of all of the advertisers who are in the category. Don’t click on the links to contact the company unless you plan to use the service on the website. They have to pay for the click. I only mention the ad clicks because many people that are like us own websites that bid on keywords. It would cost the advertiser money for you to click on the ad, especially if your only motivation is to offer them a domain. The trick is to determine who advertises in your keyword category, and then to visit the website to send them a message using the ‘contact’ link section, or through using an e-mail they provide there. Make a list of companies that bid on the keywords. You can also find these companies in the Google sponsor section. Also, consider visiting Bing and Yahoo. I’m not 100% sure if they use their own advertising system. However, I know that Why Park operates on Yahoo and Bing ads. Good luck. Thanks. How to find potential buyers? Have you ever browsed DN Journal to read their weekly domain sales column? Pay attention to which domains sell there. If any domains are similar to yours, you might be able to produce a sale. How? Wait a few days after the article is released. Check the Whois on either Estibot, Whois.com, or DomainTools.com. Send an e-mail to the new owner. Ask them if they are looking to acquire any additional domains beyond their recent purchase. They may request your domain portfolio in that particular niche. Domain tools are effective for selling domains. Invest time into contacting people that recently purchased a domain name. If they spend $10,000, $20,000, $30,000, or even $40,000 on a domain, and you have another that is similar, then you can at least try to make an effort to contact them. Money is not an issue. All you need is a commitment to buy a domain. The hardest part of selling a domain is finding a buyer that wants your domain. A price request essentially shows interest in a domain. Selling becomes hard when you don’t receive any replies. Even a reply rejecting a domain can lead to a future sale. Now you know they will reply back. You have their information. I received an offer that is only 10% of what I could I have gotten from another company. I ruined the sale several months ago. I searched for a buyer, which a company that bids on the keywords in that particular category made a small offer. They respected my persistence and professionalism. However, they were set on one price. The price was very little. It would net me a small profit, but it’s nowhere near what I failed to get on the last deal. The last offer had nothing to do with price. I complicated the sale with sharing too much information. I couldn’t salvage the deal after ruining it. I don’t mind because I made a recent sale, and have two pending sales that more than made up for that mistake, I learned from making mistakes on past sales to sell more domains. We have to learn the hard way. Otherwise, domaining will not be a challenge. Buying the right domain to sell to the right end-user is a challenge. However, knowing who to sell to before purchasing the domain can be worthwhile. I buy to sell. I retain some domains I like, but the remaining are on sales watch. Don’t get too attached to your domains. Thanks. Good luck.